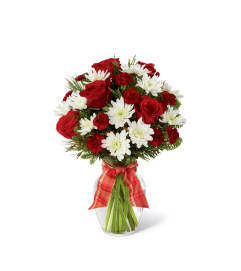 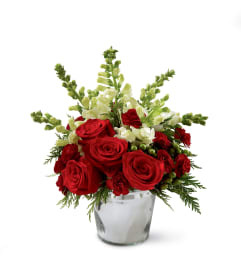 When you want your gift to inspire a holiday full of fun, this attention-getting bouquet is a natural. 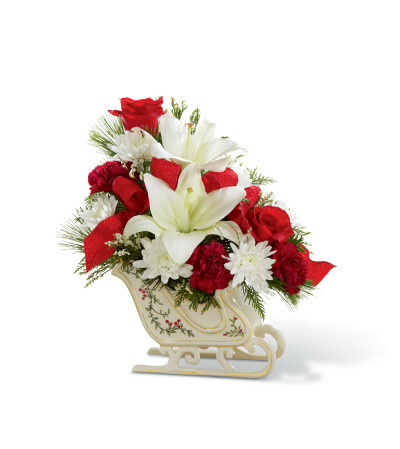 This classic bouquet, newly updated for 2015, includes red roses (in Deluxe, Premium and Exquisite versions only) and carnations, snowy white Asiatic lilies and limonium with the festive addition of classic Christmas greens meticulously hand- arranged in a ceramic keepsake sleigh. It makes a dashing table centerpiece and a beautiful way to add the spirit of jingle bell joy to any space at home or at the office.